Russia has rejected Western criticism over the number of foreign observers invited to December's general election. Russia's Central Election Commission head Vladimir Churov said 70 monitors from the Organization for Security and Co-operation in Europe would be enough. The figure is less than a quarter of the number allowed for Russia's 2003 polls, and the OSCE says it is facing "unprecedented" curbs. The US has said it was "concerned and disappointed" by the Russian move. The OSCE, a leading democracy watchdog, often sends monitors to elections. Its 56 member states come from Europe, Central Asia and the US and Canada. The OSCE typically sends a delegation of election observers to a country after receiving an official invitation. Mr Churov told Russia's Gazeta daily that 70 OSCE observers invited by Moscow to monitor the 2 December poll was "more than a sufficient number to ensure the normal process of the elections". He said other countries sometimes invited even fewer OSCE monitors. "It doesn't change anything, those elections are still considered democratic," Mr Churov said. Earlier, Moscow warned the Western countries not to interfere in the elections. "No country will accept any attempts from abroad to try to influence it," Kremlin spokesman Dmitry Peskov said on Wednesday. "It's a matter of sovereignty of the country," he added. Mr Peskov was speaking shortly after the OSCE had said Russia was seeking "unprecedented" curbs on its monitors. "This is not business as usual," Urdur Gunnarsdottir, spokeswoman for the OSCE Office for Democratic Institutions and Human Rights, said. "We now need to consider the implications of those restrictions, as they may seriously limit the possibility for a meaningful observation" of the elections. Ms Gunnarsdottir also quoted Russia's invitation letter as saying Moscow was "ready for a dialogue on the composition of the mission". 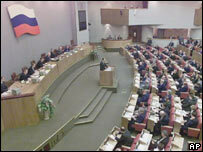 December's elections are expected to deliver victory to United Russia, the largest party loyal to President Vladimir Putin. 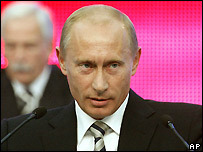 Mr Putin, who steps down as president next year, is popular among many Russians for his economic and foreign policies. However, opposition groups and human rights activists have accused him of resurrecting Soviet-era authoritarianism.